On the face of it, Bisiesto appears to be some kind of double-siesta for which the tropics can be famous. It actually means "leap year" in Spanish. 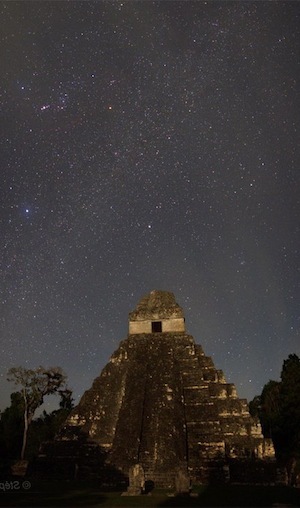 Like 2012, which in a sense contains a double leap year: the conventional add-on day at the end of February (the 29th), plus the leap into another era as the clock winds down on this epoch of the Mayan calendar. 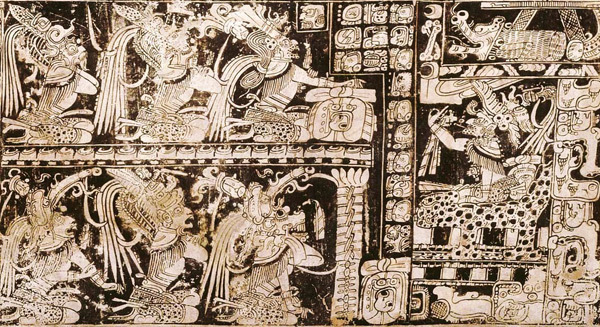 Ya know, the whole 2012 Deadline spawned by True History of Chocolate author & preeminent Mayanist Dr. Michael Coe back in 1966 when he relayed that the Mayan calendar resets its odometer clock in reaching the end of a 144,000-day cycle called a b’ak’tun (roughly 394 years). Then, in a Nietzschean-like ‘eternal recurrence’, this wheel of time rewinds in sync with their cyclical nature of it. Picked up since by the likes of Terence McKenna, Novelty Theorists, Timewave Zeros, & now a galactic-laxative in the mufti-science called ‘New Age’ as a scenario for a doomsday shift, 2012 could ruin chocolate as we know it (not to mention the rest of your life). Fear not, C-spotters®. The world is not going to hell in a hand basket; the world is coming to chocolate. The shape-shifters at Nova Monda & Giff Laube on the ground in Nicaragua who sourced this cacáo form part of that collective of optimists, idealists, romantics, dreamers, visionaries, radicals, pioneers -- imagineers who happily pioneer the borders of chocolate -- to see to it that the pleasure principle will operate well beyond 12/21/12. “Creation Vase of the 7 Gods” (found at Naranjo & now housed in the Nat’l Museum of Archaeology, Guatemala) discusses the beginning & end of this Epoch which implicates an Armageddon-type deity — the underworld warlord Bolon Yookte’ K’uh, set to rock the planet on December 21, 2012 — a new day that could live in infamy. The accompanying script narrates “on 4 Ahaw 8 Kumk’u it was set in order: Black-is-its-Center” (Chan Ahaw Waxak Kumk’u tzakhi Ek’-u-Tan). The named location – Ek’-u-Tan – refers to the universe in a blacked-out state as the Sky awaits to be lifted away from the Primordial Sea. Phenomenal control. Tannins on the verge of a bitter insurrection but kept in check on this side of savory. Nova Monda really curving the roast to this seed's advantage, carving a roast beef of sorts in the process. Oh, & so sanitary they must've hired Mr. Clean for the winnowing. Nary a speck of shell on these whole bean beauties. 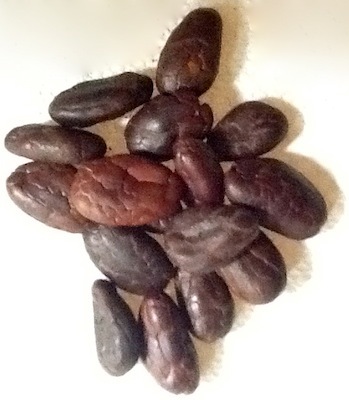 A cacáo gathered by Giff Laube from quality tree stock of a seed mix planted on one property. 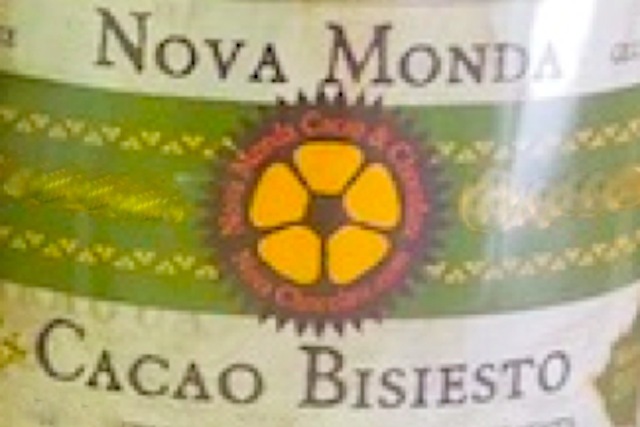 Fine tasting beans / nibs do not necessarily translate into great finished chocolate. Indeed latent core CQ (or baseline cocoa flavor) in this, admittedly, locked-up format awaiting to be unpacked, indicates perhaps limited end flavor in a bar. But, as is, good bones, good breeding & good basting once these hit the saliva glands for some strong snacking. The boys at Nova are grillin' & partying... choc on.